Lunch at Bill Brown's Apt. Wow! It’s April already, and the new Rotary year is only two months away. It doesn’t seem like almost two years ago that I assumed the role of President of the Canton Rotary Club. It’s been a great ride. I look forward to finishing up the year on a high note with our Beverage Tent at Liberty Fest in mid June. Plans are well underway for this event. Please clear your calendars from June 14th through June 16th, as we will need “all hands on deck”, especially on Friday and Saturday nights, to continue the success of our signature fundraiser. If anyone is interested in going to District Conference, please contact Sue, John, or AG Russ Jones immediately. Sue and I would love to have your company at the Conference. Please check out upcoming speakers and events in this newsletter. I look forward to the rest of this Rotary year and our weekly Rotary fellowship. Foreign Exchange Students Gustav and Konrad share their experiences with our members. The Canton Rotary Club enjoyed fellowship and foreign lands on April 2, 2018. At our monthly evening meeting we were privileged to hear from Konrad from Germany and Gustav from Denmark, two of District 6400's Youth Exchange Students. Each student gave us a background on their country and shared their own personal story. Both are high school students in their home country and will go back home to finish their high school career. While here they are attending local high schools and making lots of new friends while living with a local host family in their respective communities. 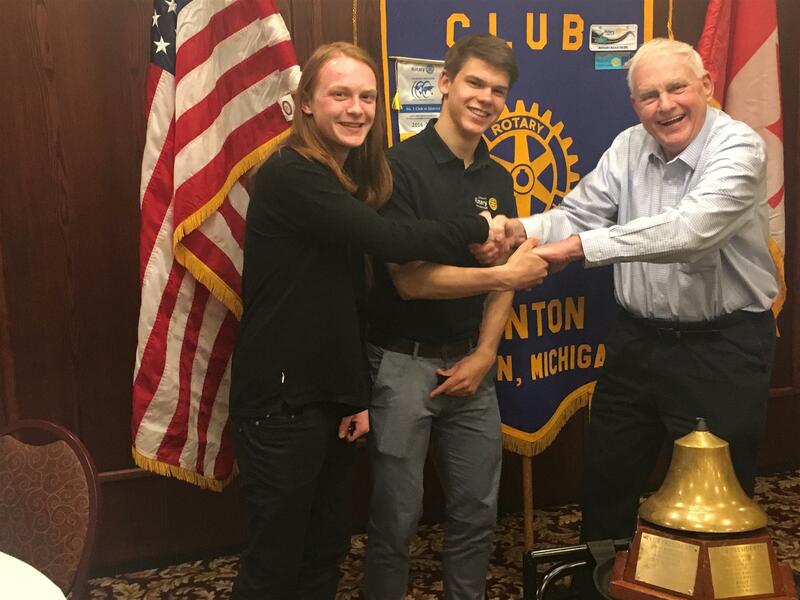 Both students expressed their gratitude to the Canton Rotary Club for hosting the pizza and bowling party for exchange students, as well as hosting the International Luncheon for the exchange students. 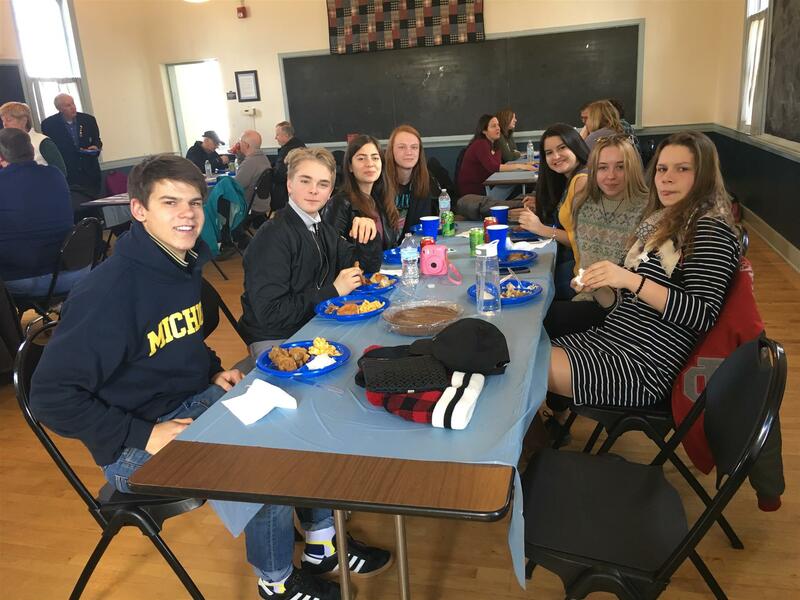 These students enjoy getting together with the other exchange students in the District where they share experiences and establish friendships that will last a lifetime. In keeping with our informal evening format, we all enjoyed a great dinner and lots of Rotary fellowship. 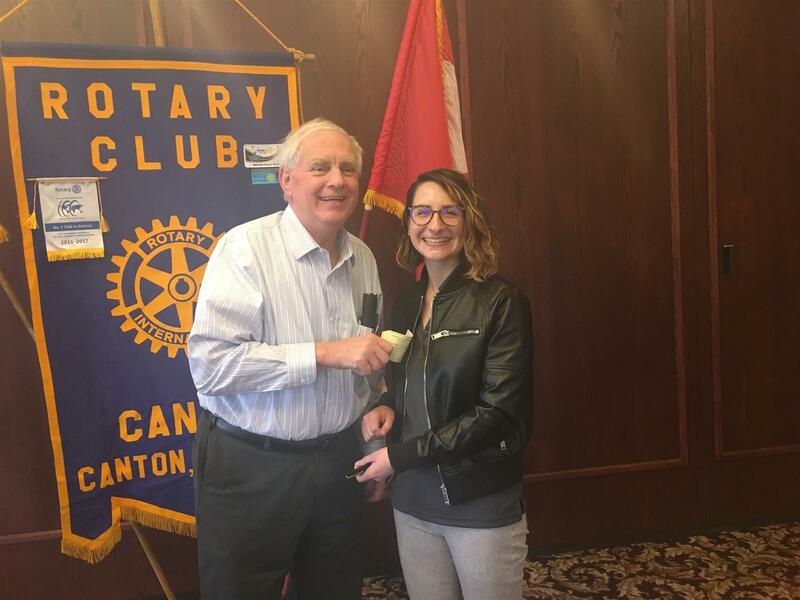 Our guest speaker and host today was our Rotary member Abe Vinitski, Parks, Golf & Facilities Maintenance Supervisor, of Canton Leisure Services. The Canton Chamber of Commerce Auction was discussed with two possibly from the club to go. Sat., April 14th at 8:00am-12:00pm is District Assembly. Check the link for details and let John or Sue know if you want to go. Deadline to register is April 6th. We will register as a Club and not individually. Also, please bring in your food donation items for the District food drive as discussed the end of April. A reminder that the club grant application is due May 30th. Abe was our speaker today and he shared his experience with the creation and on going development of the B.L.O.C.K. after school program here in Canton Township. He handed out a detailed flier on the program's services and illustrated many features that included enrollment membership requirements / features / and benefits, possible expansion and a second location (as it has been quite popular), outreach programs, professional paid staffing utilization, provisions for transportation & shuttles, new security systems, donation examples made by local Canton businesses, and a review of the history of the program that also included previous locations. He then took the club on a tour of the facility that left from the cafeteria, to the registration and check-in room, play rooms, computing facility, music room, TV rooms, and study rooms. We also reviewed the block guidelines, daily programs, and calendar of current events. We thanked Abe for speaking to us and hosting the club tour and our meeting place today. Pizza was our planned box lunch today (non Italian, but hot and lots of variety). Happy Easter everyone. Our guest speaker today was Ava Kiblaw of The Society of Women Engineers. We had a good turnout for the Youth Exchange Luncheon and Tour last Saturday and it was well received by the host families there. Members are reminded that the Area 5 Ghana school project is still accepting donation items. Ava Kiblaw and Dr. Alan Cooper visited our club today to update us on the 2018 activities of the Women Society of Engineers here in Southeast Michigan. Ava started the presentation with the SWE Annual Report for 2017 that covered a membership of about 400. She then gave the club a bit of her history and experience with Consumer's Energy as a Chemical Engineer. Ava then discussed many active areas of the SWE that included their outreach events, skills training, professional development conferences, Girls Exploration Day, partnerships with local colleges and universities, new scholarship programs, and the benefits to members and organizations of those members. We then had a vivid Q/A session following and the club made a $500 donation to the organization for 2018. We thank Ava and Alan for joining us today. Ansel was our Sargent today and we had a good St. Patrick's day trivia history session. Meat Ravioli was our lunch special. On March 10th the District 6400 Youth Exchange Students met for lunch and a special International dessert tasting party. This year District 6400 has seven Youth Exchange students from around the world. These students enjoy getting together and sharing their experiences with each other and with our Rotarians. 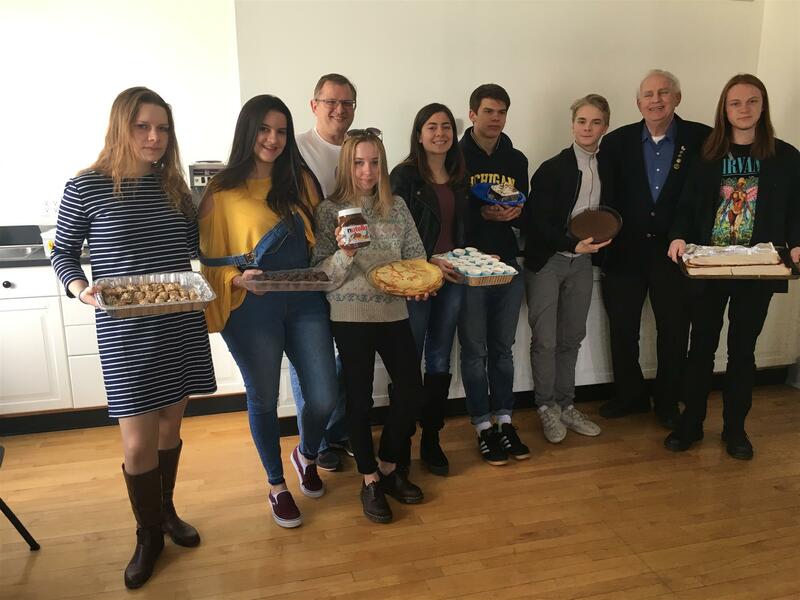 On March 10th the students, along with their host parents, District 6400 DG Rick Caron, and Rotarians from The Canton Rotary Club gathered at the Cherry Hill School for a luncheon of Lee's fried chicken with all the sides and dessert provided by the students. All of the students were asked to bring a dessert representative of their home country with enough portions for everyone to try a taste. We had seven delicious deserts, and the tastes were full sized servings! After lunch the students and adults went to the Bartlett-Travis House for a tour. This is an historical home built in the 1840's, moved to a special historical district in the Township in 1988, and renovated and restored to its original condition. It is now used for parties and Township events, as well as being available for guided tours. After touring the home, the students had an opportunity to view old farm equipment in the historic barn on the property. The students and adults enjoyed the afternoon and the Rotary fellowship. Thanks to all of the host parents for providing transportation and helping the students prepare their dessert. Our guest speaker today was Lieutenant Dale Waltz of Canton Public Safety. Sat., March 10th is our Youth Exchange Luncheon and Tour at the Cherry Hill Schoolhouse and Bartlett-Travis House. A reminder that the club grant application is due May 30th. This is targeting to support trees, hydration units, benches, and a Little Free Library in Griffin Park (similar to Flodin's). Lt. Dale Waltz was our guest speaker today from Canton Public Safety. He first gave the club a bit of his background and training when he started with the force here in 1996. 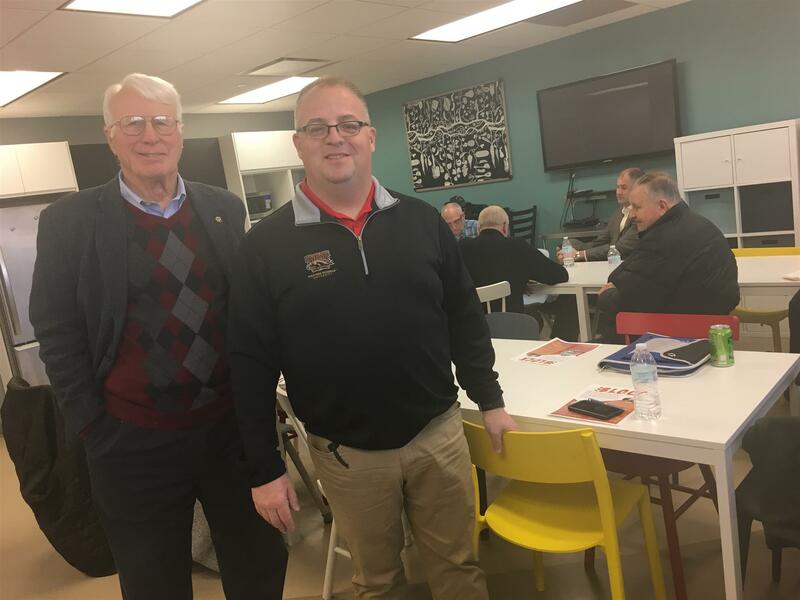 He then gave the club a brief history of several of the programs that have been serving the Township that he has been involved with including the Hate Crime Unit, the "Not in our Town" organization, parallel programs for continued education with the Public Library, and integrated leadership programs. It was an evening meeting so we ordered from the menu at Antonio's today.